Macadamia Nut Oil helps to lock in skin moisture and softness. Vitamin E, Glycerin, Signature Oil and Sheer Optical Illuminators. Our reputed entity is engaged in supplying Avon Body Lotion. From our wide consignment, we are affianced in supplying AVON Body Lotion. Silky Moisture Creamy Body Wash with Argan Oil gives skin a renewed healthy radiance with lasting moisture. Leaves skin soft and silky. Our company has been successful in winning appreciation from the clients as one of the most prominent names in supply of Avon Body Lotion. Avon body lotionWe are a trusted Supplier of Avon Rose and Peach Body Lotion from Madhya Pradesh, India. The Avon Rose and Peach Body Lotion offered by us leaves skin with a sheer radiant glow after the very first application. Avon Rose and Peach Body Lotion we make available has advance formula containing pearl powder. The entire range of the Body Lotion is reasonably priced. Vita Moist, with Vitamin E, Vitamin A, known to improve skin's elasticity, and Provitamin B5, known to moisturize. 13.5 fl. oz. 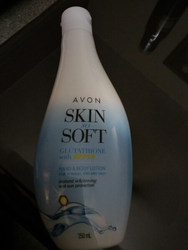 Banking on our enriched industry experience, we are able to supply Avon Body Lotion. Avon body lotion leves skin healthy, conditioned & soft all day. Non sticky, light weight, skin feels velvety. 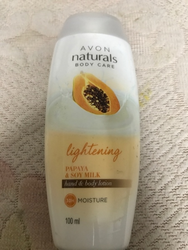 AVON Body lotion Naturals Papaya Hand and Body Lotion Provides 30 hour (long lasting) moisturization leaving skin supple, velvety and healthy. Has a creamy texture, is lightweight and non sticky. A good source of Vitamin A, papaya helps to remove dead skin cells, brightens & hydrates skin. Rich in Vitamin E, soymilk moisturizes & removes skin discolorations.